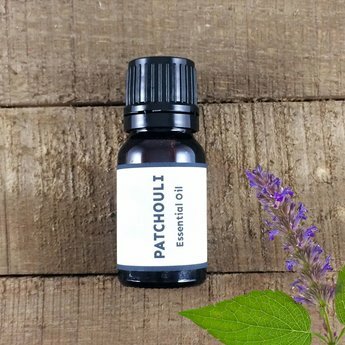 Patchouli (Pogostemon cablins) essential oil is a 2 year aged patchouli that has an amber color with a rich, earthy aroma with a woody undertone. It is a warming and stimulating essential oil making it a reputed aphrodisiac. Like other rich earthy oils, Patchouli makes a great base for perfumery. Due to its antimicrobial properties it is typically used as a deodorant, used on wounds and acne. Atlas cedar, bergamot, clary sage, clove, lavender, lemon, lime, mandarin, neroli, palmarosa, rose, rose geranium, sandalwood, sweet orange and vetiver. Fun facts: In the middle east they use patchouli to repel flees and lice from bedding. In Asia it is used as a bug repellent and to help with snakebites. In India the sacred aroma is used to scent ink. Cautions: Patchouli is considered non-toxic and non-sensitizing.